DR. JONATHAN HOUDMONT is a Lecturer in Occupational Health Psychology and Director of the Masters in Workplace Health in the Institute of Work, Health and Organisations (I-WHO) at the University of Nottingham, UK. His research interests focus on legal and policy issues in occupational health, and the role of occupational health psychology in education and training. He is Executive Officer of the European Academy of Occupational Health Psychology. DR. STAVROULA LEKA is an Associate Professor in Occupational Health Psychology and Director of the Masters in Occupational Health Psychology at I-WHO. Her primary research interests are the application of occupational health and safety knowledge and policy in the workplace, and psychosocial risk management. 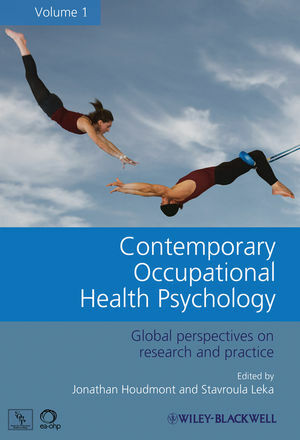 She is Chair of the Education Forum of the European Academy of Occupational Health Psychology. 1 A Multilevel Model of Economic Stress and Employee Well-Being (Robert R. Sinclair, Lindsay E. Sears, Tahira Probst, and Mark Zajack). 2 Developing New Ways of Evaluating Organizational-Level Interventions (Karina Nielsen, Raymond Randall, and Karl Bang Christensen). 3 Leadership and Employee Health: A Challenge in the Contemporary Workplace (Töres Theorell, Peggy Bernin, Anna Nyberg, Gabriel Oxenstierna, Julia Romanowska, and Hugo Westerlund). 4 Employee Burnout and Health: Current Knowledge and Future Research Paths (Arie Shirom). 5 Large-Scale Job Stress Interventions: The Dutch Experience (Toon W. Taris, Ingrid van der Wal, and Michiel A. J. Kompier). 6 The Neglected Employees: Work–Life Balance and a Stress Management Intervention Program for Low-Qualifi ed Workers (Christine Busch, Henning Staar, Carl Åborg, Susanne Roscher, and Antje Ducki). 7 Personal Resources and Work Engagement in the Face of Change (Machteld van den Heuvel, Evangelia Demerouti, Arnold B. Bakker, and Wilmar B. Schaufeli). 8 Work and Health: Curvilinearity Matters (Maria Karanika-Murray). 9 Peer Assistance Programs in the Workplace: Social Support Theory and the Provision of Effective Assistance to Employees in Need (Maya Golan, Yael Bacharach, and Peter Bamberger). 10 Individual Adaptation to the Changing Workplace: A Model of Causes, Consequences, and Outcomes (Jane D. Parent). 11 Building Psychosocial Safety Climate: Evaluation of a Socially Coordinated PAR Risk Management Stress Prevention Study (Maureen F. Dollard and Robert A. Karasek). 12 Internet Addiction and the Workplace (Noreen Tehrani). 13 Organizational Culture and Knowledge Management Systems for Promoting Organizational Health and Safety (Dolores Díaz-Cabrera, Estefanía Hernández-Fernaud, Yeray Ramos-Sapena, and Sara Casenave). 14 Work–Family Positive Spillover: Where Have We Been and What Lies Ahead? (Kristi L. Zimmerman and Leslie B. Hammer). 15 The Impact of Psychological Flexibility and Acceptance and Commitment Therapy (ACT) on Health and Productivity at Work (Frank W. Bond, Paul E. Flaxman, Marc J. P. M. van Veldhoven, and Michal Biron). 16 Corporate Social Responsibility and Psychosocial Risk Management (Stavroula Leka, Gerard Zwetsloot, and Aditya Jain). 17 Risk Factors, Consequences, and Management of Aggression in Healthcare Environments (Benjamin Brooks, Alice Staniford, Maureen Dollard, and Richard J. Wiseman).